Exactly How Dirty Is Your Office Restroom? | Crystal Clear Enterprise, Inc. Exactly How Dirty Is Your Office Restroom? Most of the world’s population spends one-third of their entire adult lives working at their workplace. One-third of that time is, in all probability, spent using the office restroom. The hygiene—or lack thereof—of your office lavatory speaks volumes about what kind of a business you’re running. We’ve all heard dreadful stories about the microbial zoos that are public restrooms. Your office ones are no better. Imagine working hard all day and then going into restrooms that look like an accurate enactment of a horror movie scene. Not only will that flush employee morale right down the toilet, it can also lead to them contracting dangerous diseases. Office restrooms can harbor harmful bacteria such as staphylococcus, streptococcus, and E. coli, in addition to cold and flu viruses. Take it from us, you don’t want your employees coming down with various illnesses and taking sick leaves round the clock. It can cost you more than it costs to keep your restrooms clean. There are some simple and easy-to-follow restroom etiquettes that employees can adhere to in order to maintain a clean and safe bathroom environment. Don’t blush when using the toilet flush. Always flush the toilet after using it so that it is nice and clean for the next person. Remember to keep the lid down! Don’t TP the whole restroom. A restroom with toilet paper strewn around it is not a sight for sore eyes. Make sure to deposit your used tissues in the bin. Don’t skip the suds. Always clean your hands after using the toilet. Always! Not only is it hygienic for your own self, it is also hygienic for others that you meet. Don’t leave your DNA sprinkled across the bathroom floor. Unless you want a creepy stalker to clone a mini-me of you, don’t scatter your hair or nails on the bathroom floor. Do hire a reputable cleaning company. When it comes to large corporate offices or big-scale businesses, simple toilet etiquettes just don’t cut it. You need a professional cleaning business to take care of your business. Here at Crystal Clear Enterprise, we know the importance of maintaining clean office restrooms. 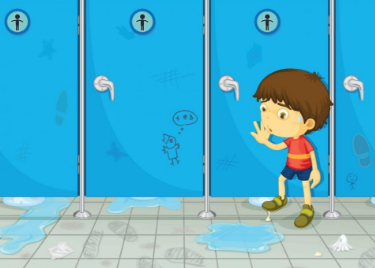 Unhygienic bathroom conditions are health hazardous. 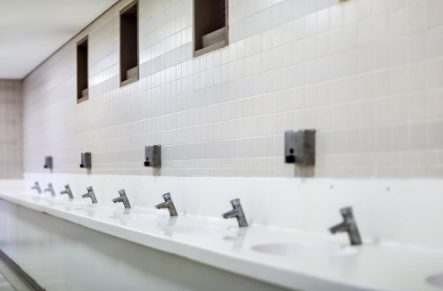 Not only that, dirty washrooms can greatly affect your image for any visiting clients and customers. You may want to wow them out of their senses with your impressive services, but you don’t really want them to contract hepatitis from an unclean restroom. Crystal Clear Enterprises’ Restroom Sanitation Program is just the solution for your sanitary needs. With our excellent janitorial services, you’ll be leaving a smile on people’s faces.